Bordoverview Blog invited Vincent Bache-Gabrielsen to share his insider's view with us on the Bordeaux 2009 vintage. Since 2003 Bache-Gabrielsen is technical director of Château Belle-Vue and Château de Gironville (both Haut-Médoc) and neighbouring Château Bolaire (Bordeaux Supérieur). In addition, since the 2009 vintage Bache-Gabrielsen is also in charge at Pauillac classed growth Château Pédesclaux, and Château Lilian Ladouys in Saint-Estèphe. Both estates were acquired by Jacky Lorenzetti in 2008. It will be worth following the developments at these two châteaux. Pédesclaux is known as a notorious underperformer since long, and with the change of ownership the future of this classed growth is shining. 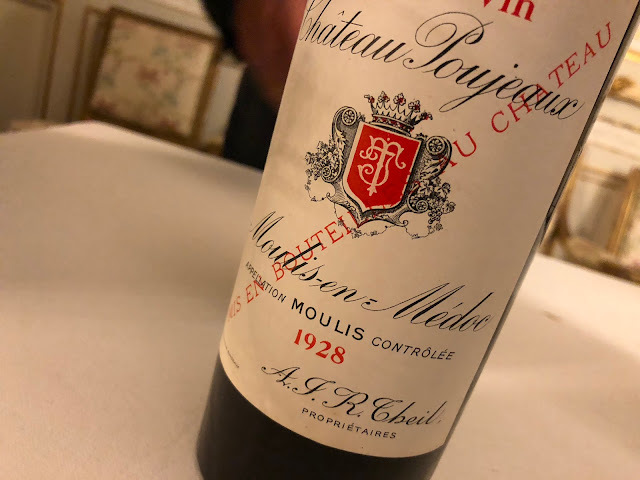 With the malo ended, and in some cases still in progress, it is a good moment to take a closer, and detailed, look at the much talked about Bordeaux 2009 vintage. Bache-Gabrielsen's experience is focused on the Médoc, yet spans this area from south (Belle-Vue, De Gironville) to the north (Lilian Ladouys). Vincent Bache-Gabrielsen − In September 2008 Jacky Lorenzetti asked me to take charge of the winemaking at Château Lilian Ladouys. The aim was to revive the château's glorious past of the late eighties. A lot of hard work began in order to make this wine as good as possible. After having finished the 2008, we began to prepare the 2009 vintage. Pruning was redefined in order to have the best spreading out of the grapes. All interventions that can help create the best ripening of grapes are done. Unwanted branches and leaves are removed. In May 2009, I also started at Château Pédesclaux, which was bought by Lorenzetti as well. We had the opportunity to put in place a very qualitative preparation of the vine for harvest. In both Lilian Ladouys and Pédesclaux, it was the first time that such work was done. Weather in 2009 was quite perfect to make a great wine. Nevertheless, some rain in May and June allowed mildew to become a bit aggressive and we had to be watchful in order to protect leaves and grapes against this disease. We also have to remember the hail that destroyed some vineyards in Entre-deux-Mers, Saint-Emilion and Margaux. The village of Labarde, where Belle-Vue has one plot, was affected. Luckily, we were at the edge of the cloud and we didn't have any damage. In July, August, September and until October the 20th, we had very dry weather (only 19 mm in August - one third of the normal rainfall, and 20 mm in September). From the first of October to the 20th, we had no rain. At the end of August, we waited for a little bit of rain, because some Merlots vines in gravelly soils showed some signs of thirst. The berries were very small and some grapes began to shrivel. Luckily, some rain arrived around September the 19th (15 mm) and allowed ripening to continue in good conditions. But the berries were still small. The juices would be very concentrated but the yields would probably be lower than expected. In Saint-Emilion and the Graves region, the rains were very important and reached nearly 100 mm, which allowed some vintners to accelerate their harvest while others waited longer in order to concentrate the grapes. When we made the first samples of grapes at the beginning of September, we found an incredibly high level of sugar and quite low acidity. The question of when we have to harvest rises and will be the center of every conversation with others winemakers. Some want to harvest early, some want to wait. The berries tasting, using the method that we created at Château Belle-Vue in 2003, will give the answer. While there is a lot of sugar and the color is very dark, the skins still are very tough, releasing some green aromas and tannins. We chose to wait until the end of September, but some prestigious neighbors in Macau or Saint-Estèphe began between September the 14th and the 19th. This period is always very difficult because there's a lot of pressure on our shoulders. A lot of owners or winemakers concede and harvest rapidly, in order to reduce risks. But I am convinced that decisions at this stage determine the quality of the future wine and that calculated risks are indispensable to make great wines. An enormous amount of work of tasting berries begins at Château Belle-Vue, Lilian Ladouys and Pédesclaux. Lilian Ladouys has more than 170 plots and we have to taste the berries 2 or 3 times to settle the good harvest date. The weather is still perfect for ripening. Days are hot and dry, nights are cold. Therefore, we have a good synthesis of aromas and tannins. We started harvesting the plots of Merlot of Château Pédesclaux and Château Lilian Ladouys on September the 30th. We waited until October the 2nd for Château Belle-Vue. We harvested in order to protect integrity of fruit and conserve all the aromatic potential. The grapes were healthy and the sorting was not hard to do before destemming. But it is hard to separate berries from stems. It is probably because of the small berries and the pretty hard skins. We put in a lot of work sorting after the destemmer and we are really happy with our new system of optical sorting, using a new machine that separates the green parts from the berries, using cameras and compressed air. September weather concentrated grapes and sugar levels were very high. Some Merlots were higher than 16% alc vol and some Cabernet Sauvignons were higher than 14%! Luckily, the acidity was good (pH between 3.6 and 3.8) and the average of each vat was not higher than 15% alc vol. The Petits Verdots were perfect, with high sugar levels combined with big acidity and a huge color. These big levels of alcohol are moderated by freshness and intense tannins. After harvesting the Merlots, we waited some days until starting the Petits Verdots and Cabernets. While walking along the vines, we found a few berries attacked by rot so we decided to continue harvesting. We chose to use cold maceration before fermentation in order to extract fruit and soft tannins in aqueous phase. We succeeded in keeping the must at a temperature under 5°c for more than 10 days (until 28 days on a vat of Merlot). Considering the high level of sugar, we think that it is imperative to use selected yeasts. We chose bayanus on Merlot (more security) and more qualitative yeasts on Petit Verdots and Cabernet Sauvignons that do not have so much sugar. We were a bit surprised by the color which appeared slowly, even during the long cold maceration. On gravelly soils, it will be the same for the tannins. The first fermented vats of our neighbors analyzed by the laboratory show a light color and few tannins (IPT* are about 50). The 2009 vats need considerable work. We use the technique of délestage exclusively at Belle-Vue and Lilian Ladouys and alternate with pigeage at Pédesclaux. Tannins are very soft and we extract very late in the fermentation. While we should have stopped extraction very early in the fermentation because of the alcohol levels, the numerous tastings indicated that we could continue our work. We also have to be careful with fermentation temperatures. We control temperature to be under 25°c in order to have good conditions for yeasts. After fermentation, we chose to empty a vat in order to fill the others. We want to have a long maceration in order to harmonize this big structure (some vats have IPT* between 100 and 141). The wines seem to be sensitive to oxidation. We finished the pressing on November the 25th, about 2 months after the beginning of harvest. Malolactic fermentations are finished at Pédesclaux and happening now at Belle-Vue and Pédesclaux. We have to be careful with brettanomyces that can develop during this period. Ageing will have to respect fruit and the high quality of tannins. The high alcohol level in our wines will make them extract the tannins of wood and we have to be very careful on preserving these wonderful wines. We made a drastic selection of new and old barrels (one and two wines) in order to eliminate any imperfections. Bordeaux 2009 is very special. Even with a high percentage of alcohol, they are not hot. They have freshness, density and are very expressive. They have the combined qualities of 2003 (aromas) and 2005 (structure). They present chalky tannins. Only the best vats of 2005 had this quality of tannins. They are already smooth, without aggression. The challenge will be to preserve all these qualities and stabilize them with ageing. Cabernet Sauvignons show a very long mouth and will once again be the stars of the Médoc. Bordeaux 2009 is again an excellent year for Petit Verdot (and we are thinking about planting some at Château Pédesclaux). *The IPT (Indice des Polyphénols Totaux) is a measure of total tannins (including anthocyanins and therefore reflecting color) in grapes. The average in Bordeaux was 70 in 2000, 73 in 2003, and 78 in 2005. This shows a significant increase over time: in 1982 it was between 62 and 63. This means that total phenol levels have increased from 5 g/l to 6 g/l over 20 years [source]. Follow the future updates on the Bordeaux 2009 vintage on Twitter, Bordoverview Blog, Bordoverview (from April 2010) and – for Dutch and Belgium readers – www.bordeaux-2009.nl.